“Morning Vision” demonstrates Ann’s technique of painting on a smooth surface; using Strathmore 500 series, 5 ply, High Plate Illustration Board. 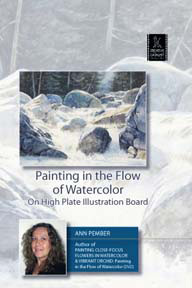 Ann Pember’s watercolor landscapes prove that the painter, not the paint, makes the difference in great art. With a limited set of pigments and tools, she creates texture and variety that suggest a full palette and an arsenal of brushes. In this workshop, Ann uses only three blues, two earth tones and two brushes to paint a peaceful, atmospheric river scene she designed from two reference photos. The simplicity of Ann’s materials allow you to concentrate on design and technique. She explains her favorite application and texturing methods, as well as the advantages and intricacies of painting on illustration board. Ann grants equal attention to each shape in her composition. She forgoes a flat wash and concentrates on individual elements to ensure lifelike variation across the high plate board. She returns to each rock and tree with clean water to clean and soften edges, helping the eye flow through the scene. The forces of nature play a part in Ann’s process as much as they do in her landscape scene. She works with her board at an angle, relying on gravity to weave patterns into the flow of her watercolor. She creates additional texture by spritzing the painting with clean water and an old toothbrush. The delicate spray adds dimension to the boulders and suggests intricate paths in the water. 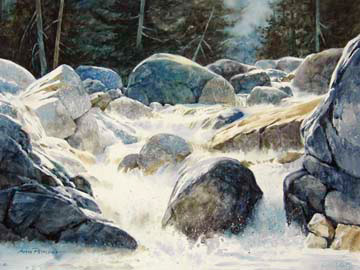 With the rocks and river in place, Ann uses her earth tones to mix bold greens for the background trees. She demonstrates a range of techniques for painting tree cover: lifting white branches from blocks of color, swirling edges with a flat brush and dotting in leaves with the brush’s edge. I was absolutely absorbed in watching this video, and so impressed by Ann’s talent and the clear, concise way that she demonstrates her technique in the video. I can hardly wait to try painting on high plate board, and am hoping that she will consider producing another video using 300 lb. watercolour paper. Watercolor, DVD. I sat down in my studio and completed my first “good” watercolor. I’m a graphic designer and have dabbled in watercolor for the last few years but now I’m hooked and really excited. Your tips and pointers were invaluable and I’m finally happy with a watercolor that I have created and there will be many more to come. Softening the edges and spritzing the toothbrush turned my first waterfall scene on the Strathmore plate into a fairly good composition. I still have much to learn, but my confidence is soaring. Thank you so much for sharing your talent so that others like myself can learn. 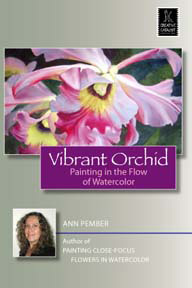 Ann Pember’s explicit guidance by talking through her thought process while taking the viewer Step-by-step, make this DVD one for beginner or advanced painter. 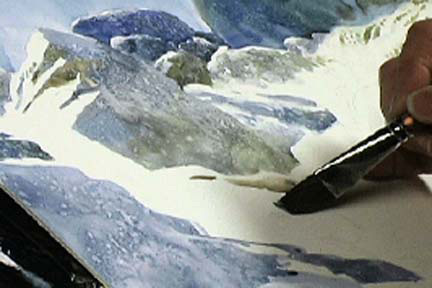 Limited palette, few brushes and easy techniques produce a successful watercolor within a painter’s grasp as well as take some of the apprehension out of the medium. Close-ups followed by distance shots shows us the importance of stepping back regularly to see how the shapes work in the whole picture. It is definitely an encouraging and motivating teaching video to own. I rate this DVD a 5. WOW! Be prepared for an intense lesson. This lady makes the most of details and perfecting her techniques. Vivian M.
Last winter, I purchased one of your videos from CCP and wished to tell you that your technique for painting rocks and water is wonderful. Since my very first workshop, which was a great learning experience for me, this is the most fun and success I’ve had with a painting in years. Your paintings are terrific and you have a great talent.